The multi award winning Worcester Greenstar range belongs to the highly successful Bosch group. The Worcester-Bosch Greenstar 12i System boiler packs a punch with it's high energy efficiency rating of 94 per cent. It manages to achieve this by employing a robust aluminium-silicon heat exchanger exclusive to Worcester-Bosch. The extra large surface area of the heat exchanger allows exhaust gases to cool to around 55'C such that the latent heat contained in them can be used effectively rather than disappearing out of the boiler flue. This ability to extract as much useful heat as possible from each unit of gas consumed is what allows the Worcester-Bosch Greenstar 12i System to operate so efficiently. In doing so the Worcester-Bosch Greenstar 12i System also helps to reduce the amount of carbon dioxide (CO2) gas the main contributor to global warming released into the atmosphere. This award winning System boiler does require a hot water storage cylinder, but all the other major components including the expansion vessel, circulating pump etc. are built in to the boiler unit itself and are wired, plumbed, and tested as a complete system. This allows the appliance to be efficient, reliable and easy to install. This boiler is also recommended by the Energy Saving Trust, which is a testament to the efficiency this boiler has achieved. 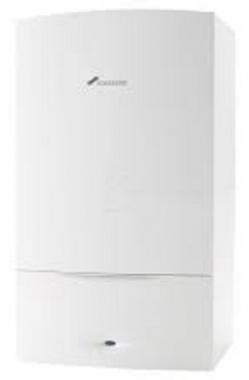 The Greenstar i System boilers are wall mounted and designed to be compact, which makes them a good option for small to medium sized properties. Their size also allows for them to be fitted in a variety of places. The i System boilers are compatible with a wide range of optional digital controls, like many other boilers within the Greenstar brand. These boilers are compatible with Greenskies solar panels and are also kind to the environment due to their low NOx and CO2 emissions. [x] Greenstar 15i System - a central heating output of 15kW with an efficiency rating of 94 per cent. [x] Greenstar 18i System - a central heating output of 18kW and is 94 per cent efficient. [x] Greenstar 24i System - this one has a central heating output of 24kW and is 94 per cent efficient.